A dinosaur. A jungle. Ruthless poachers. Heroic natives. All the elements are there for a rip-roaring adventure in Bill L. Norton's 1985 yarn, Baby: Secret of the Lost Legend. Unfortunately, it's one of those movies with a lot of heart which doesn't have the storytelling prowess to back it up. Its biggest drawback is Baby, the young dinosaur discovered in the African jungles by British paleontologists. There were more believable animatronics in Disney World rides at the time, and the cartoonishly designed Baby is so awkward that it's hard to feel anything toward the character, who is so key to the emotion of the narrative. 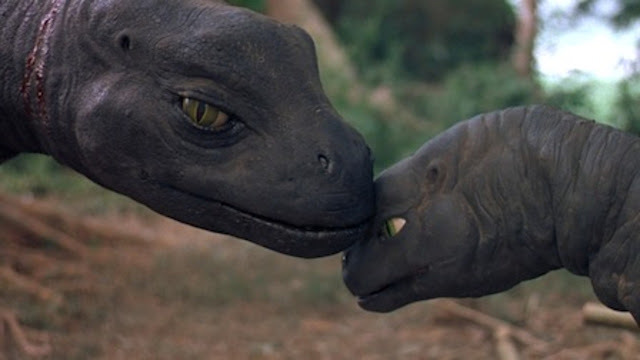 The film was inspired by the legend of the Mokele-Mbembe, a dinosaur-like creature said to inhabit the African jungles near the Congo River. Two teams of Paleontologists travel to Africa to prove his existence. One is lead by Susan Matthews-Loomis (Sean Young), who research was stolen by the villainous Dr. Eric Kiviat (Patrick McGoohan) who desperately wants to claim the discovery for himself. While Matthews-Loomis and her husband, George (William Katt) find Baby and his family first, Kiviat and his lackey, Nigel (Downton Abbey creator Julian Fellowes), aren't far behind, determined to capture a live dinosaur specimen to return to England. There's a conservationist streak running through Baby, as the heroes attempt to stop the Western powers from removing the endangered animals from their natural habitat. But the film itself is hampered by its languid pacing and primitive visual effects. McGoohan (who would go on to be Braveheart's evil Edward the Longshanks 10 years later) is great fun as Dr. Kiviat, even if his ultra-serious performance feels like it belongs in a less campy film. He takes the whole thing so seriously that it's hard not to admire the steely resolve with which he greets the silly material. Young also makes for a strong lead, a female hero and scientist at a time when such things weren't commonplace in mainstream cinema (and let's face it, they're still not even in 2018). The new Blu-Ray from Kino Studio Classics looks as good as it possibly can given the film's somewhat low-rent visual quality, and Jerry Goldsmith, the king of writing great music for bad films, turns in a fantastic score. There may be some nostalgic charm to its Land of the Lost-esque tale of exotic adventure, but those that didn't grow up with it may find that nostalgia isn't enough to make this lost legend worth uncovering. 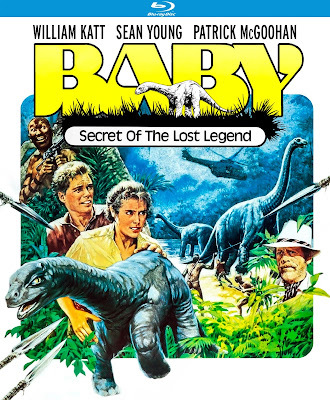 BABY: SECRET OF THE LOST LEGEND | Directed by Bill L. Norton | Stars Sean Young, William Katt, Patrick McGoohan, Julian Fellowes | Rated PG | Available on Blu-Ray and DVD from Kino Studio Classics on Feb. 13, 2018.